I'll Cross That Leg When I Get To It.....: Distracted!! It might be afternoon by the time I am done posting this but I assure you, I am starting it in the morning. I have good intentions but you know how that goes. I hope everyone had great weekend. I can't say that I got a ton done this weekend. Laundry and grocery shopping were the top two items on the list and they did get done but the rest of the list kinda went by the wayside. It's like this. I got distracted. I was at the shop Saturday till 4:00. Then Dan picked me up and we went grocery shopping. So far so good. We got home, unloaded the groceries, put them all away, I cleaned out the fridge and then made supper. Still on track. Ran the dishwasher, watched an episode of Fringe and threw together an egg casserole for breakfast Sunday morning. By this time it was 11:00p.m. so bed was calling me. Loudly. Sunday morning dawned bright and clear, I bounded out of bed anxious to start my day, okay, I'm lying. I rolled out of bed, hit the shower with my eyes still closed, did my hair and minimal makeup, sorted the clothes and carried the first load down the stairs. Threw them in the washer, turned on the oven, cleaned up the kitchen a bit, put the casserole in to cook and then sat down to read blogs, check email and play some games on facebook. I'm still on target at this point. First load of laundry gets done, I throw it in the dryer, go upstairs to get the next load, tell Dan breakfast is almost ready and he needs to get up so he'll be ready to head to Lowe's as soon as we eat. Wake Adam up, everyone eats, I throw another load in the wash and off we go to Lowe's. It's only 10:00 at this point. I'm doing good on the laundry and as soon as I return from Lowe's I'll start the cleaning. This is where things started going awry. Our mission at Lowe's was to pick out paint for the library. I adore the current color of the library. It's rich and cozy and very library like until you see it next to the woodwork and then it's like a sour note in a beautiful piano piece. Kinda ruins the whole thing. So in my head I have chosen a rich cozy very library like Olive green. It would look great with the woodwork, there is already olive green in the rug, and olive green in the dining room so this should be an easy pick. WRONG!!! That's the problem with having a vision already in your head. Number one, you rarely can translate exactly what is in your head and make it work in reality. Number two, people look at you funny when you say, I can see it so clearly in my head, they start wondering if you listen to voices in your head too. I try to ignore them most of the time. The voices I mean.....What's that? Nothing! I heard NOTHING! You didn't hear anything did you? I sit down on the couch to study the samples. #1, like it but with the green in the dining room it's too yellow, #2 too bright, #3 is okay but not making me go ahhhhh, #4 too blue. What do you think Dan I ask? He liked #1. 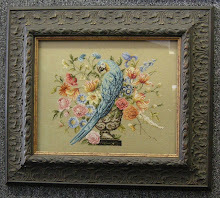 Hmmmm, yeah, I like #1 but look at it with the colors in the dining room. Now what do you think? He states that he doesn't think it has to work with the dining room. I state that I really think it needs to since they are open to each other. So there we sit. Pondering paint. While the day dribbles through our fingers. Back and forth we go. Finally at 2:30 I tell him to go sand and stain a piece of woodwork so I can see it with the woodwork on the wall. thirty minutes later he's back. Till next time, thanks for stopping in and commenting. Love those comments!! I like 3 or 4 the best. For me (and of course this is just what appeals to me) the others would be too dark and intense all over the whole room. Those two are lighter and seem like they'd be less overwhelming. My first thought was number three - from the left. 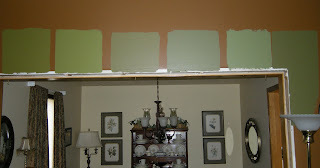 I hate picking paint - I usually discuss with my hubby what we think would work and then let him pick the final color. I did have a good laugh at your day though. Hope you get the colour you want soon. Definitely #3...it struck me as soon as I looked at the picture. I learned a long time ago that there is a huge difference between a small splotch of color on the wall and the whole wall in that color...things appear alot different. Plus, "it's only paint...if you don't like it, paint over it"...LOL! I can say that, as it took me three coats of paint to be happy with my craft room color! I like #3 the best but I wonder if my opinion would change seeing it in person. And for the record, I definitely think if 2 rooms are open to each other they need to flow together. I'm with everyone else. Number 3 is the best of the bunch. Good luck! #6 and then #1... Yes, with the dining room, lol. Good luck! I think #3 blends in too much with the dining room. #3 and #4 look to gray to me. Cripes...why didn't you tell me you were Watching paint during my phone call ... I would have called back!LOL! I hate deciding these things...you are so good at it, you will decide and it will be beautiful! Meanwhile I am pleased that your house matches mine this week...A MESS! You have got an(other) award dear! Do visit my blog!! Love the paint samples! I am glad to know that someone else lets time get away from them without realizing it! lol. I'm digging #3 as well, and #6 isn't bad. But just to further confuse things, you could take the mat from the pictures in the dining room and have them color matched if you want a paint that brings the color into the library. And I know what you mean about having a vision in your head. I had one in my head about the living / dining room for a while. When we bought the house, the dining room was eggplant purple on top, cream on bottom, with a shiny brass chandelier. 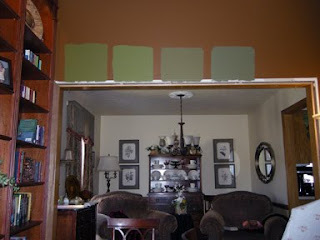 The living room was faux painted with a coffee brown on 3 walls and a blue on the 4th. I hate faux painting. I knew I wanted to do both rooms in blue and white and I saw a GORGEOUS dark blue color on a TV show. 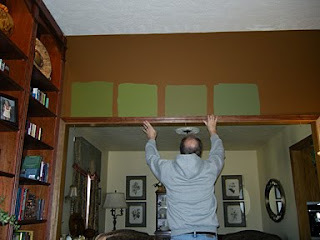 I immediately went to the HGTV website, looked up the show and found the color was called Evening Dove (Benjamin Moore). Our dining room is now a beautiful dark slate blue with white trim, and the living room / library is lighter blues with a wall full of white bookshelves. I love going in there because it's exactly how I envisioned it, so keep at it. It's SO worth it. So much to think!! You cannot just choose one because it is the color that will be there every morning when you wake up. It must be very exciting redoing the parts of your house. But sometimes when we have to make serious decisions one thing lets to another and suddenly you are thinking in anything else and you say to yourself: I’m distracted, I was thinking about an important matter. But we have to make an effort and focus. That way we make decisions more effectively. I go with 3, too. I find it so hard to pick green colors--it can easily go too minty or too primary. Good luck! On my way to Retreat!